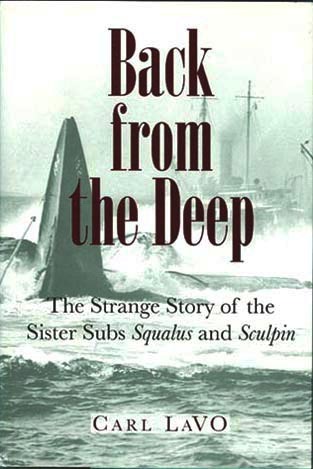 “BACK FROM The DEEP” The Strange Story of the Sister Subs, Squalus and Sculpin. By Carl LaVO. This epic World War II submarine saga follows the two subs as they play out their dramatic destinies in the Pacific. In 1939, USS Squalus (SS-192) sank during a test dive off the east coast of the United States. Sister sub USS Sculpin (SS-191) was there to assist in the rescue of her crew. Later in World War II, Sculpin is sunk by a Japanese destroyer. Fate intertwines as Squalus, now renamed Sailfish, sinks an enemy carrier, unintentionally killing 22 POW’s of the rescued Sculpin who were aboard the stricken carrier. 1994 Hardback edition with dust jacket. 227 pages, 26 black and white photos and an index.